In 168 Hours, Vanderkam presents a proposal designed to help readers define their life's "core competencies" and make better use of their time each week, all 168 hours of them. While there are many helpful and practical tips within the book's pages, Vanderkam's blinders to crucial considerations like economic class are surprising. According to the author, defining one's core competencies is as simple as determining what your priorities in life are and whether or not your time usage reflects these long-term goals, commitments, and responsibilities. For example, Vanderkam values writing each day, spending time with her children, and exercise. She emphasizes that for everyone, exercise must be a priority. Though certainly other life needs may arise each day, if the bulk of her time isn't spent in one of these veins, she believes reevaluation needs to occur. This principle makes sense. Along these lines, Vanderkam encourages readers to eliminate or severely limit activities such as TV watching which waste hours and are not actually, scientifically relaxing. Alternatives like reading are far more productive and rewarding. If at all possible, she encourages her audience to find a way to get paid to do what you love, what you would do anyway even if it wasn't your job. The invitation to self-reflect what you're passions and strengths are and how your career could mirror these fulfilling avenues is an encouraging and optimistic approach to considering your weekly usage of time. However, Vanderkam's examples of how she personally applies these principles have major real-world problems. Exhibit A: Many of Vanderkam's solutions are about throwing money at your problems. For her, if you find it a waste of your time or energy to do things like cooking, laundry, or cleaning, then hire out. If this solution makes sense, congratulations, you benefit from economic class privilege and this is an opportunity afforded to you. If this solution surprises or upsets you, then find solidarity and empathy within the majority of human beings walking the planet we call home. In her application of this money-throwing method (my words, not hers), Vanderkam doesn't mention people who suffer from unemployment or under-employment, limited incomes, racial, gender, or ageist discrimination, or homes and human lives with special needs or health concerns. To be fair, she once makes a nod to villages where children spend hours each day gathering water, but she makes nothing of this point and it feels as if she divides the world into two clear-cut categories: third-world countries and everyone else whom she believes to be exactly like herself. Should people who are concerned with how they're spending their time take the invitation to reevaluate their schedules? Absolutely--her encouragement here is welcome and appropriate. Do you need to keep an hourly accountability chart as she recommends? That's your call. Is it a good idea to include family, your passions, and things like exercise among your list of priorities? Yes, if you have access to these wealthy resources (meaning, you are blessed to have family and/or friends, you have the economic opportunity to invest in your passions and daydreams, and you have the physical and emotional health enabling you to exercise). 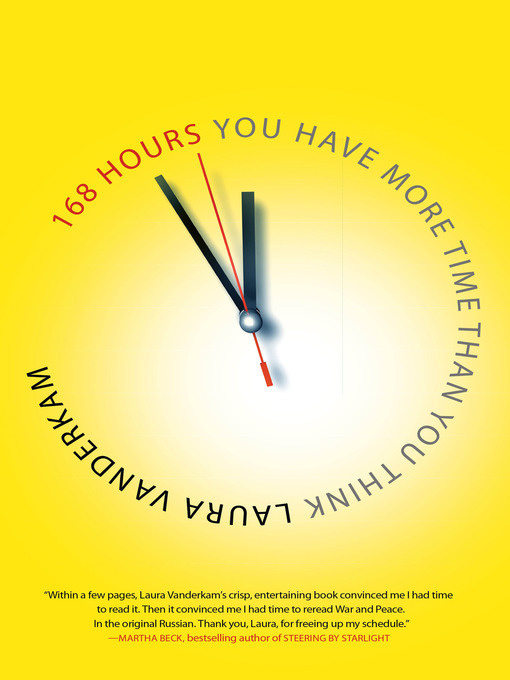 While 168 Hours contains some helpful suggestions to those who find themselves wanting to re-prioritize, the narrative does itself a disservice through endless humble-bragging and relative blindness to individual diversity. Further, there is little here that hasn't been pointed out elsewhere. Frequently redundant and definitely contradictory in at least one passage, Vanderkam wants you to keep track of your hours. In general, "waste not, want not" is sound enough time-management advice on a surface level, but don't forget those among us who don't waste and still want. YES! I found a lot of good points here (I was looking for ways to maximize time, especially as I went from working in an office to working remotely, AND moving to a new area, AND, AND, AND), but I was SO annoyed by her "just hire it out!" mentalities. I felt like in her work life she was able to give a lot of examples about how to increase efficiency and be better with her time, and none of them were "outsource everything! Pay someone else to do it!" However, in her home/every other aspect of her life, she did zero thoughtful reflection. Even simple things like "make a meal plan for the week, go to the grocery store once, and then stick to said meal plan" did not come up. Instead, the options were "go to the grocery store--or two--every day at 5:30 pm when it is busiest, and then spend hours making complicated recipes" or "hire a personal chef to shop and cook for you." Instead of "keep things generally tidy, then speed-clean for 2 hours on the weekend" it was "your house is always a mess and you are always hating how messy it is because, life" vs "hire a cleaning service." So...yeah, I got a lot from some pages, and loathed the rest. Brilliant points! I hadn't thought about the public/private divide. You're so smart--I love that.